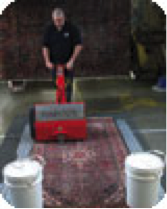 In-plant rug cleaning has a long history in the United States and Europe. In the 1950s the U.S. had more than 200 large in-plant rug cleaning facilities. As wall-to-wall carpet gained in popularity, many plants closed. The most frequently used cleaning agent was soap, which was replaced after World War II with synthetic detergents. 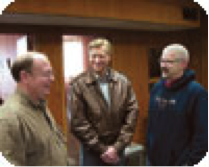 The Moore Co. of Elkhart, Ind., has a long history with the rug cleaning industry, manufacturing a majority of the equipment used to wash rugs for the last 65 years. The company began with the Moore family’s purchase of a dry-cleaning business in 1930. They began cleaning rugs in the late 1930s, but found “automatic” equipment of the day only could clean 10 rugs per hour. So the family began producing high-speed rug washing equipment and the Moore’s Time Saving Equipment Company was born. While the most popular automatic rug-cleaning machine in the U.S. is from Moore, there are other, similar machines, such as the Connersville MIRZA and the Cleve-O-Matic, two companies that have long been out of business. 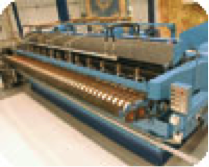 Over the years, the Moore Co. has installed equipment in hundred of rug cleaning plants around the world. Today, the company is run by Ron Moore . Ron recently repaired the automatic rug-cleaning machine for Arslanian Brothers of Akron, Ohio, following a major fire there. He is now planning his retirement and is only manufacturing rug wringers for a few select customers. When Ron retires, there is the possibility flat-bed rug cleaning equipment will no longer be manufactured in the U.S. (Image 3). The rug specialist does have some other options for equipment. Three European companies – Katas, Universal Osca and Catinet – are making centrifuge-type machines. These companies use spray-jet-type cleaning equipment with a centrifuge for drying. Two companies, RugBadger.com and Centrum Force, offer machines using this approach for rug wringing in North America. Rugs can be cleaned on a wash floor, rinsed, and then placed in a centrifuge to be spun to remove most of the water. Reports have said the rugs dry much faster than with a compression wringer and have less fringe browning. This type of equipment is important to a successful rug plant when the volume justifies the expense. 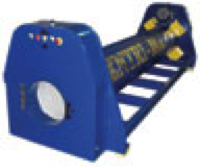 The centrifuge can be installed in a “mini-plant” with only 2,500 square feet of space. The area should include room for rug dusting and a portable wash pit to soak problem or urine damaged rugs. A roller should be used to squeeze the urine from the rug. Experience has shown this is the best way to remove urine residue. Before investing huge sums of money in rug-cleaning equipment, invest part of the budget in good training. Several programs are now available to choose from. Pick a program that meets your needs before you start doing invasive cleaning, like the immersion method. The more you attempt deep cleaning of rugs, the more hidden problems will surface.